With the release of the first Avengers movie, we all got to fully take in what appears to be known as Phase I of the plan for the Marvel Cinematic Universe. The release of Iron Man 3 and Thor: The Dark World, we're officially in Phase II of this same plan. At first it would seem that simply tying these different movies together isn't much of a change and the ultimate quality of each movie will see it through. But a shared movie universe with a generally coherent continuity is a great thing for cross-marketing across the different film titles. Each movie strengthens the overall mythos of the movies that had come before it while also hinting at upcoming developments in future titles. Each Marvel character continues to get developed further in each of the associated sequels. And then they come together for the next big Avengers movie. In that regard, Captain America: The Winter Soldier is part of the efforts of continuing to develop Captain America's story beyond The First Avenger. And it's clear that the writers really had some big ideas for this particular movie. Synopsis: Captain America: The Winter Soldier is 2014 superhero movie that plays out with some pretty complex spy thriller leanings. It was directed by Anthony and Joe Russo with a screenplay by Christopher Markus and Stephen McFeely. It has been two years since the battle of New York as seen in The Avengers and Steve Rogers - or Captain America (Chris Evans) continues to work with S.H.I.E.L.D. by lending his superior combat skills and other traits together with other S.H.I.E.L.D. teams. But after a hostage rescue mission together with Black Widow (Scarlett Johansson), Steve realizes to what lengths S.H.I.E.L.D. 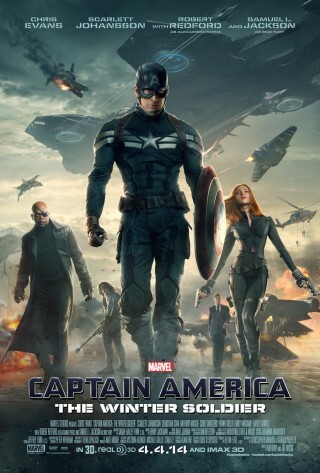 Director Nick Fury (Samuel Jackson) is willing to go in order to stay one step ahead of their enemies. In this case, Steve finds out about even more secrets being kept from him, thus further diminishing his trust in the agency. But then Nick Fury is ambushed by generally unknown assailants led by a mysterious lone figure with a metal arm. This man appears to be the Winter Soldier, a legendary assassin that has supposedly been executing high profile targets for over 50 years now. It seems almost impossible to determine just what exactly had been going on that led to Fury being killed. But as is always the case in the world of espionage, not everything is at it appears to be. Now Captain America needs to figure out what lead to Fury's death while dealing with a potential threat within S.H.I.E.L.D. itself. And this movie really plays out more like a spy movie than fighting-centric superhero movie or something. Here we have Captain America's naivety and belief in the human race coming out as more of a liability as he raises issue after issue related to how S.H.I.E.L.D. works with little result. But when Nick Fury is killed, it feels almost as if no one can ever truly be trusted again - at least not in Captain America's mind. But he finds himself leaning heavily on Black Widow for support as the two of them try determine who called the hit on Fury while evading capture from S.H.I.E.L.D. as well. A lot of people talk about the role of Black Widow in this movie in terms of how she finally represents a truly strong female character who is not dependent on her male colleagues. And given Steve Rogers was trained as a soldier it helps a lot that Natasha (Widow) is actually ex-KGB with a significant number of such missions under her belt. Thus many times she ends up leading Steve around as he sort of gets a crash course of espionage given his lack of experience while looking very girl-next-door at the same time. And Scarlett Johansson really carries a lot of the movie in this regard as she continually outwits their pursuers and helps point Captain America in the right direction. But don't worry, you'll still get a lot of Chris Evans and his terribly ridiculous physique. I swear, the man must be taking something like steroids given how hugely muscular his body is these days. He's a pretty good Captain America given the odd mix of being a man out of time while also being a take-charge kind of leader. And the writers made sure to include more than a few scenes with him being without a shirt or in very tight outfits that make the most of his superhuman body. Thus far, I think this movie had the strongest plot and really worked with the potential of its narrative when compared to all the other movies out there. But in the end the story just works and acts as a great vehicle for telling a complex tale of secrets and lies within S.H.I.E.L.D. itself. And those grim details are what give Captain American some pause as he considered the implications of things. And those are the sorts of things that make spy thrillers so compelling and exciting for viewers. The movie also finds a way to introduce a modern equivalent of Captain America's flying crime-fighting friend, Falcon (Anthony Mackie) without making him feel like a silly, dated character. Good job there, Marvel Studios. The Winter Soldier himself made for a pretty compelling villain despite having very little dialog save for the end of the movie (more or less). He didn't seem like a CGI blur or something - instead his power set felt decently realistic - thus pushing the notion that he is also some sort of an augmented soldier. The questions becomes just how the Winter Soldier came to be and how he has been able to become one of the most secret and yet also most effective contract assignment. And the whole reveal of his identity was a nice touch, although probably not all that surprising if you've been paying enough attention. Captain American: The Wilder Soldier is more than "just" a superhero movie, but pretty good action thriller that raises some great questions about post 9/11 security and what it means to be truly free. And these aren't exactly new ideas, especially with respect with the body of work that is all the different Marvel comics in recent years. Enjoy! The movie as a whole rates 5 snappy espionage tips like "Public displays of affection make people uncomfortable" out of a possible 5. And yes, the mid-credits and post-credits bonus sequences. Don't leave the theater right away!